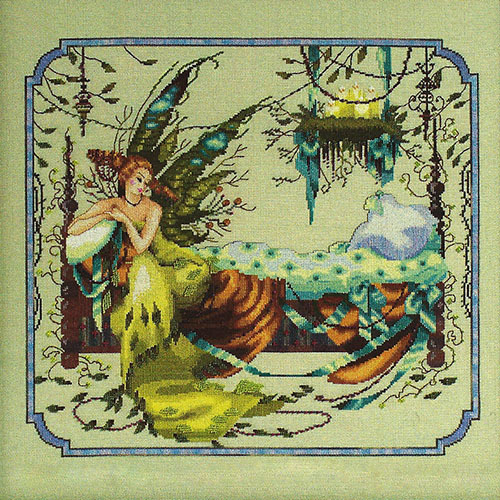 Wings at rest, a young wood fairy enjoys a private moment in her four-posted bed, surrounded by topiaries, stone angels, a steadfast bunny, and moss-draped chanOn a bed draped of watery silk and mossy vines sits a muse for fairy tales and Gothic paintings. Writers and poets wait to share her secrets. Painters try to match her alabaster skin with flowing paint. Stitchers will weave her gown with silk threads. An ethereal goddess in the woods is captured in a moment on linen. Design size: 16.25" x 15.06" with a stitch count of 260 x 241 stitched over two threads. Kit also available without fabric (£77.00), without DMC threads (£85.50), without chart (£89.00) or without both fabric and chart (£67.00).